Okay, lately the Disney channel has been showing Up, and I highly recommend watching this surreal flick if you haven’t seen it yet. The film has just enough unbelievability, but not so much that it alienates the viewer. I know that the main character’s house could probably not be held aloft by that number of balloons, but I’m willing to pardon that. What I enjoy is when the dogs talk, but this technology is never explained. This technology could be here with No More Woof. 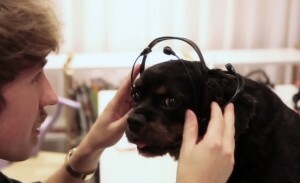 No More Woof is an EEG-reading headset with Arduinos that can somehow analyze it and translate it. You heard it correctly, it can translate barks. Years ago, I once heard a pet-lover talk about a product known as bark-lingual. Apparently, this was a essentially the same concept, but I doubted it because if someone actually created a way to actually translate dog barks, that would change…everything. This No More Woof just can fine tune translate, so you know what kind of bark your dog is doing. You know, so it can determine the “I’m hungry” bark from the “stranger at the door” bark. Do you have a hard time telling these barks apart? I don’t. Well, No More Woof has had its Indiegogo campaign, and it is apparently made its pledge goals. Apparently, it will show up with a three-emotion model for $65, or a gold-plated Pioneer version for $1,200. I wonder if this No More Woof will actually change things. I’m just going to see on this.